See below for upcoming events. Follow us on Twitter and Facebook to stay up to date with all the latest announcements. Pictures from the events and programming are posted to Facebook regularly. For more information about a program, please call 203.729.9039 and leave a message or send an email. NHS board meetings are held the third Wednesday of each month at 7pm at 171 Church St. These meetings are open to the public. Garden Club & Historical Society member, Vivian Knussi, presents a talk that will focus on the goals of key garden designers from the Renaissance Period in Italy, France & England as well as America’s own visionaries working on the East Coast during the 19th century. Ms. Knussi is an Art Historian who specializes in American Art and Photography. She is a professor at Pratt Institute in Brooklyn, NY. Ms. Knussi has also assembled a number of collections for corporate clients, focused mainly on Contemporary American Art. Garden design has long been an interest for Ms. Knussi. 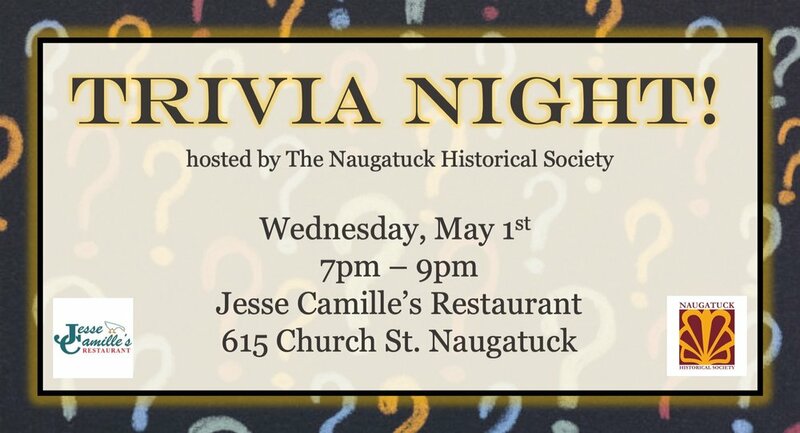 Naugatuck Historical Society at Jesse Camille’s! Test your knowledge of Naugatuck, local history and general trivia. It will be a night of laughter, learning, fun and PRIZES! The event is FREE and open to the public. Join the Naugatuck Historical Society for a FREE presentation and book signing by author and historian Marty Podskoch. Mr. Podskoch will discuss his new book, The Connecticut 169 Club: Your Passport and Guide to Exploring Connecticut, which encourages travelers to visit all of the unique towns and villages in our beautiful state. Marty tasked someone from each municipality to write a short description highlighting their town’s location, history, and interesting places to visit. The chapter on Naugatuck was written by Naugatuck Historical Society’s own Bridget Mariano & Sandra Clark! The book has a space for travelers to journal about their experiences and a place to get the book stamped or signed by a resident or business. The nearly 400-page, hardcover book will be for sale at the event ($24.95) and Mr. Podskoch will be available for a book signing. All are welcome to attend. The tour is approximately 1 hour and departs from Naugatuck Historical Society, 171 Church Street at 11:00 am, on the second Saturday of each month, from June to September, weather permitting.